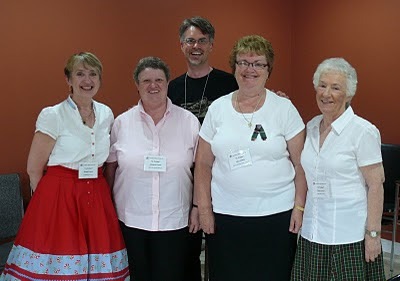 This is a recording of an interview conducted by Dale Jarvis, Intangible Cultural Heritage Development Officer for Newfoundland and Labrador, as part of the traditional dance symposium held in Old Perlican on Saturday, July 17, 2010. Interview introduced by Dr. Kristin Harris-Walsh, Centre for Music, Media and Place, Memorial University. Interviewees are (left to right in the photo) Wendy Wagner, Feather Point Dancers, Harbour Grace; Elizabeth Tuttle, Baccalieu Square Dancers, Old Perlican; Alice Cumby, Mizzen Heritage Square Dancers, Heart's Content; and, Sheila Power, Baccalieu Trotters of North River. Pardon the noise in the recording!